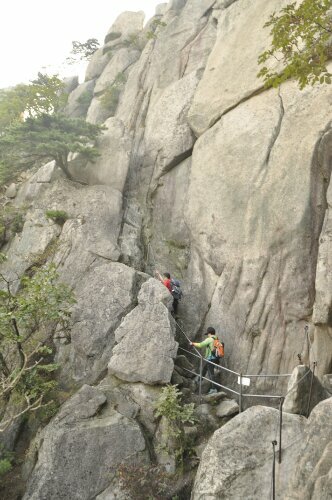 Hiking is a popular pastime in Korea. 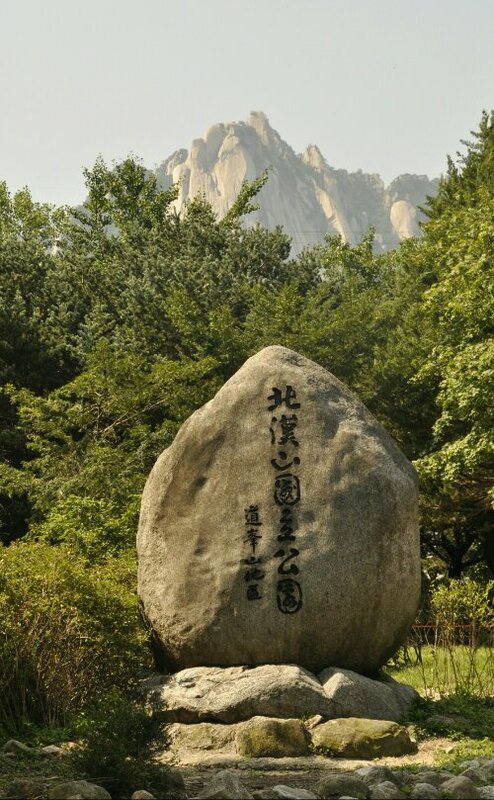 So popular that Bukhansan National Park was awarded the guiness world record for most visitors at a national park per square foot. 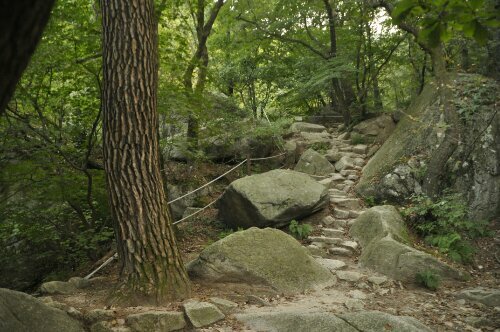 They get about 4 million hikers each year and the trails are always crowded. 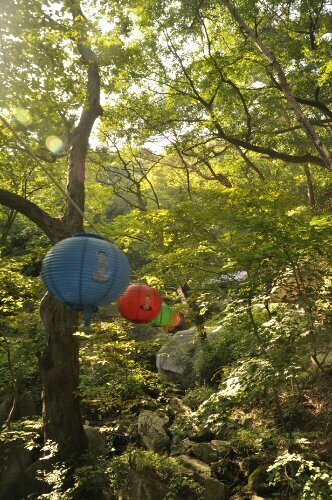 Today is Chuseok, Korean Thanksgiving and a holiday where everyone goes home, so I’m hoping the trails won’t be packed. It was just over an hour on the subway to get to Dongbansan subway stop. 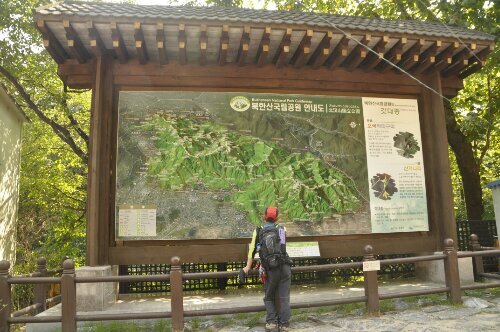 My guidebook told me to get off here and walk with the lines of hikers past outdoor equipment shops and restaurants. 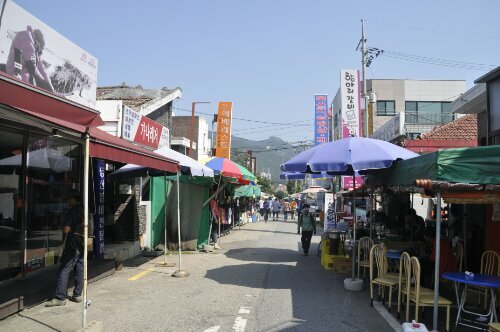 Some of the shops were closed for the holiday but it was still busy here in the shadow of Bukhansan. The view from down here got me pretty excited to start hiking; was I really going to make it to the top of that peak today? I picked up a bottle of Makali; supposedly its a common “hiking” drink. I had a few liters of water in my camelback but figured if I run out it is quite refreshing and “when in Rome,” right? 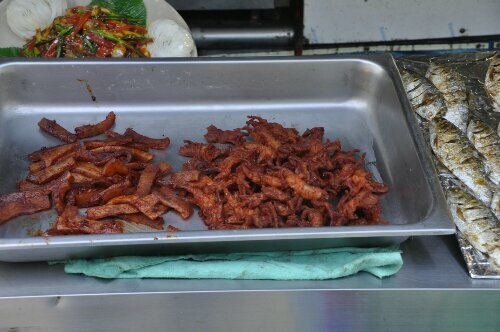 I opted not to try the grilled delicacies being hawked by the street vendors, maybe when I don’t have a day of hiking in the mountains ahead of me. It was a longer walk than I anticipated before getting to the actual park. 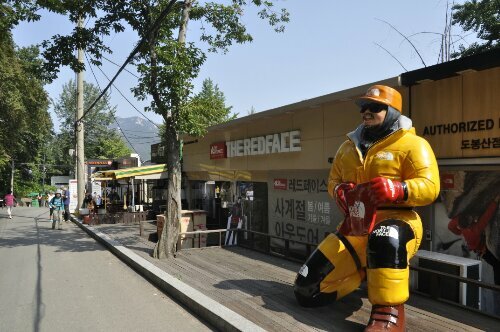 Shops lined the hiker filled streets, each with their own advertsiing eccentricity. 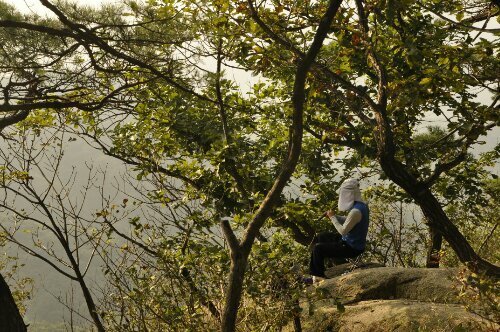 Most of the Koreans had hiking poles and were covered from head to toe. All I had was my camera, a backpack, shorts and a t-shirt. I figured I’ll be alright without poles and the cover up is due to Korean’s wanting to be as pale as possible. About a kilometer later I arrived at the info station, picked up a map and up I went. 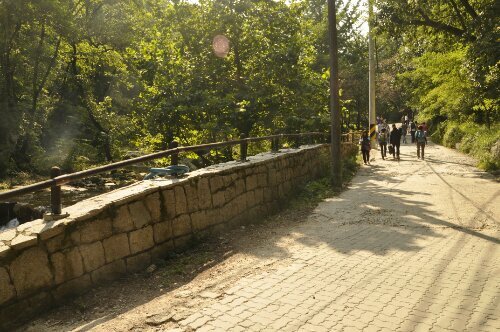 At first the path was well laid with cobblestones and bricks. 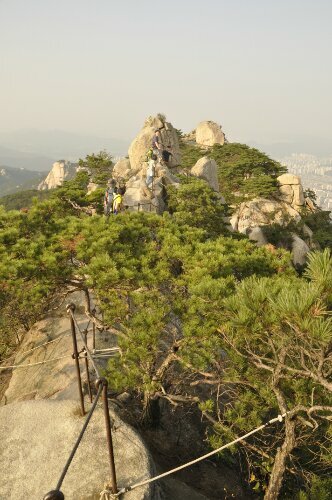 There were many people hiking up with me and we quickly arrived at Gwangnyunsa; a Buddhist temple. 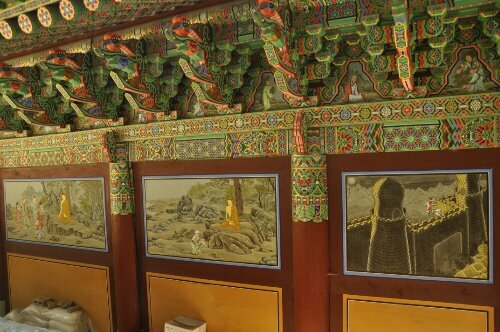 The outer walls were elaborately designed in a similar fashion to what I saw at Gongbuk Palace. 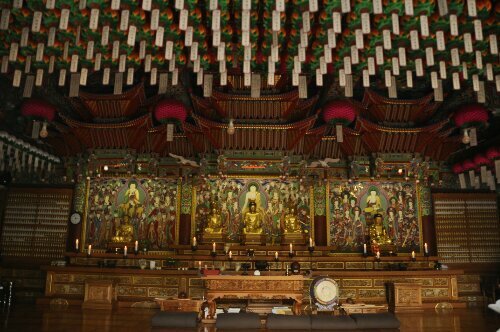 As I entered the inner courtyard I heard soothing music coming from the temple when my eyes were drawn to a display with magnificent white candles embroidered with Hangul lettering. Unable to read any of it I made my way towards the temple. 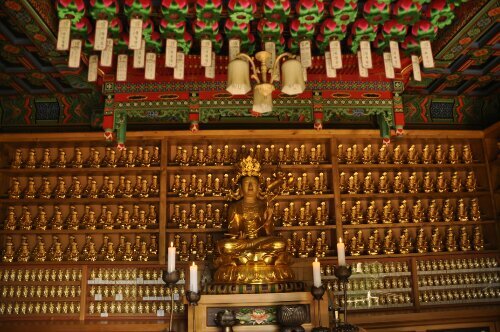 Inside were beautiful Buddha statues, a Korean man praying and even more decorations. 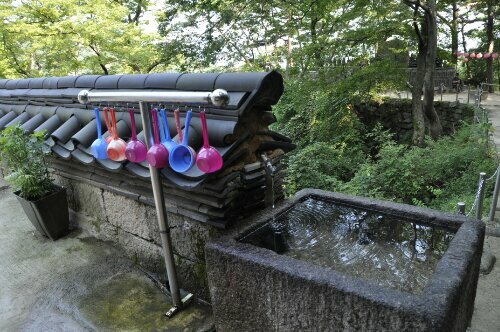 I walked the temple grounds for a few more minutes taking in the serenity. 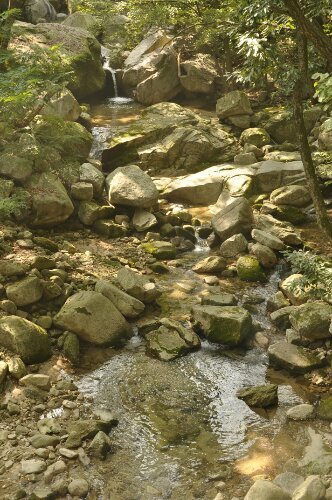 It felt very “zen” and was a great way to start my hike. 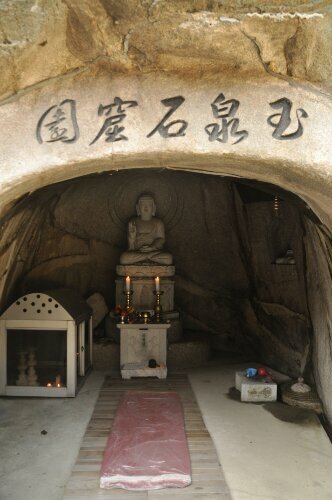 Maybe next time I’ll learn a few Buddhist hiking prayers and pay proper respects. 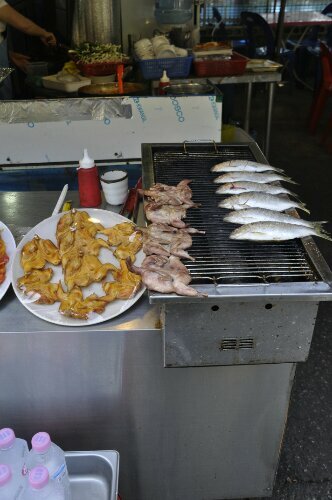 I continued on. The path quickly grew steeper as I passed a lone saxophone player. 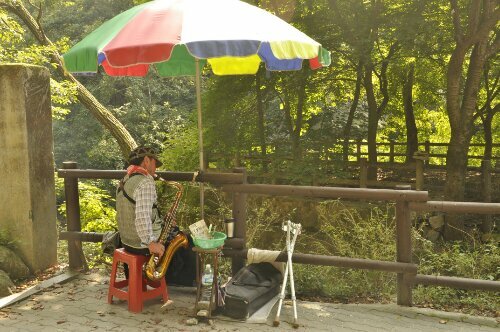 He too was playing a soothing tune; perhaps reminiscent of the nearby temples or maybe he was just having a good time. Upward I went, and up and up. 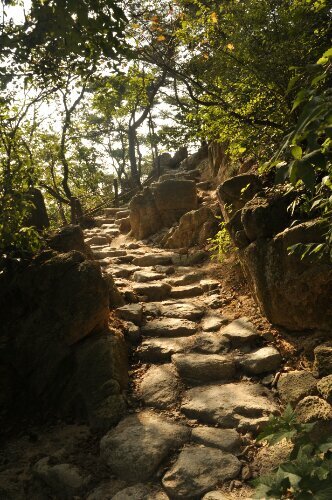 Hiking along a stream the path soon turned to cobblestone steps and grew rockier. I passed less people it was still crowded. 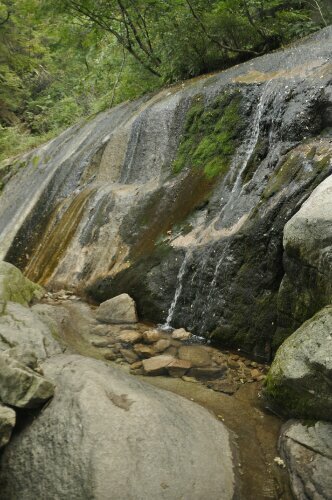 I stopped frequently to let someone come down the steep stone steps and before long I found a fountain and grabbed a drink. This might be the last one before I dip into my reservoir. Hiking onward and upward the climb continued to grow. 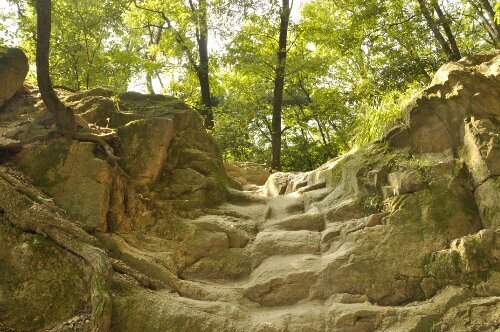 Luckily there were steps carved out of the rock. 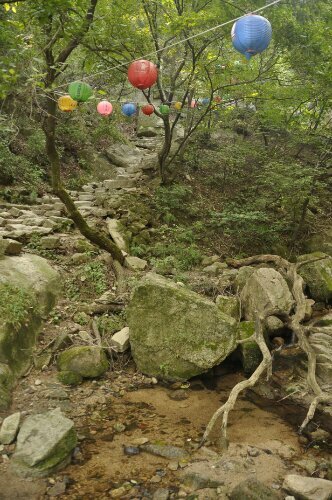 Crossing a bridge I found myself stairing at at hundreds of multicolored paper lanterns. 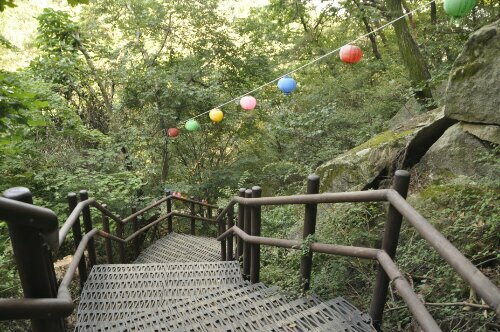 They decorated the path for a few kilometers when suddenly my trail turned into a wooden staircase. As I climbed flight after flight another soothing melody grew louder. 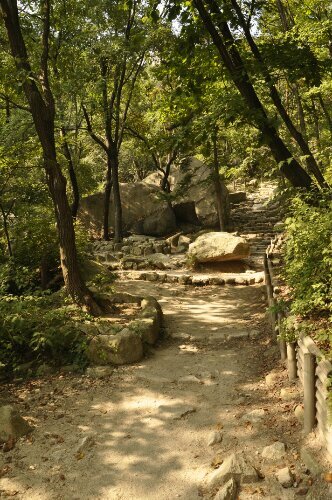 Finally at the top of the stairs I saw a sign for Cheonchuska Temple. 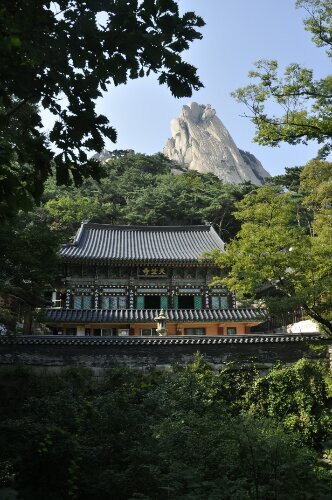 I took the brief detour and was rewarded with a stunning view of Dobongsan Peak silhoueting the temple. 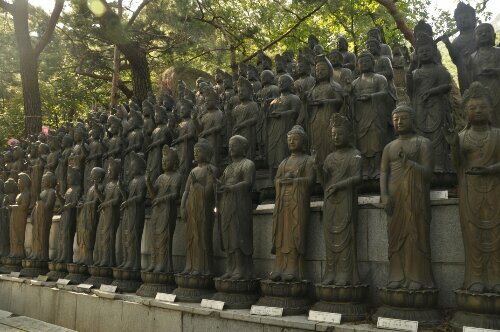 As I came closer I saw hundreds of Buddha statues enhancing the already peaceful atmosphere. 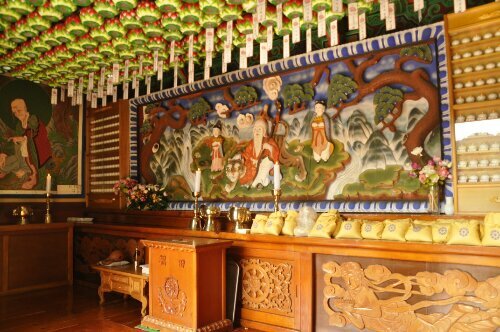 I crossed the bridge to further explore the temple and found elaborate decorations, more statues and a drinking fountain. 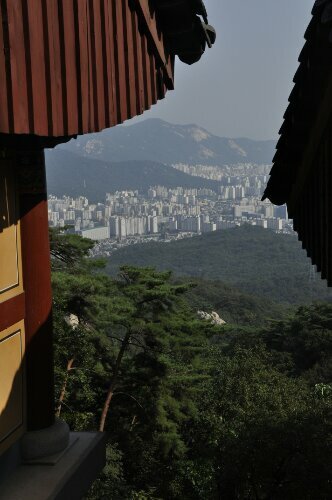 I began to explore the temple but was immediately drawn to the breathtaking view of Seoul. 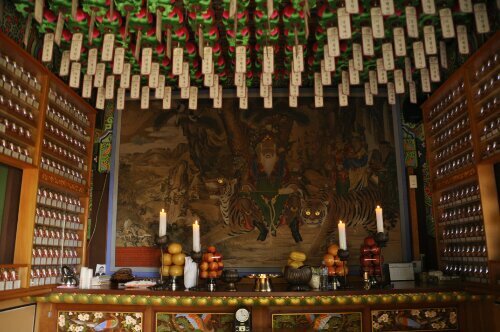 I lingered to snap a few photos of the scene before continuing into the temple. 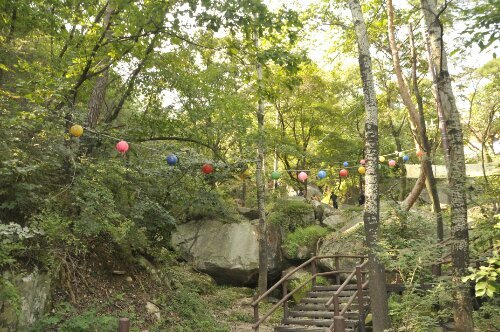 The zen-music and monotone chants could be heard throughout and brought a natural peace to the forest. I explored a few antechambers and was drawn in by the sweet smells of incense before taking a refreshing drink and continuing my climb. Exiting the temple my trail somehow grew steeper. 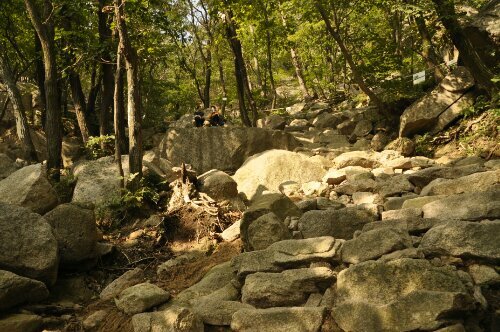 With the stairs behind me, the rough bouldered trail made for slow hiking. 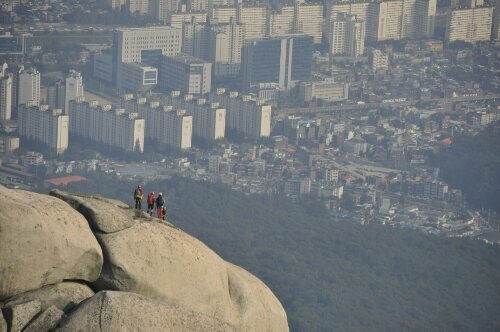 A few hundred meters and I found myself at Madangbawi, a massive rock with a stellar view of the city. There were Koreans lounging all over with rice cakes and mini-picnics. 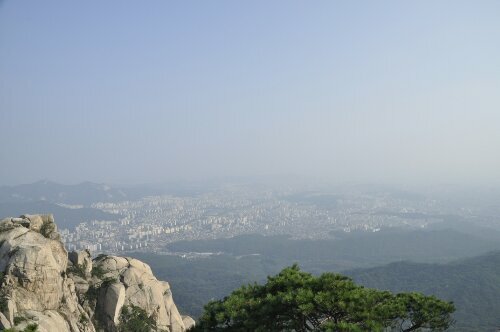 I decided to keep going; the peak couldn’t be that much farther and I wanted to eat at the top. 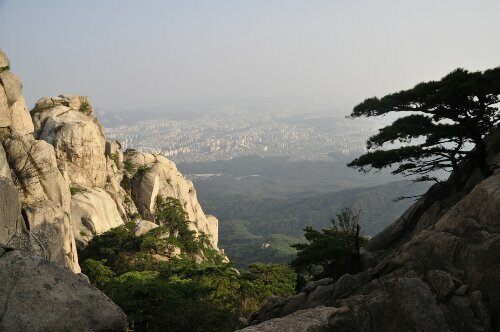 A sign told me I was a mere 500 meters from Juanbong, the peak I was aiming for! 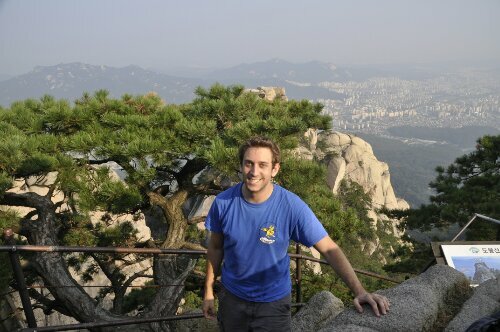 Unfortunately it didn’t mention that the rest of the climb was nearly vertical. 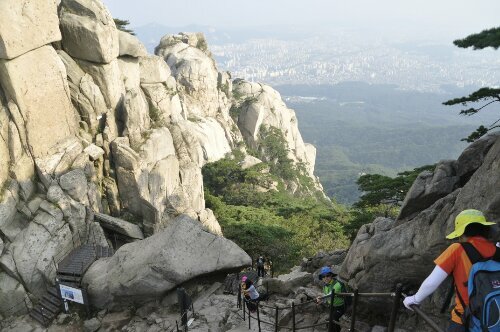 I found more hikers here as the travel grew slower; I welcomed the frequent breaks to allow someone to come down the mountain. 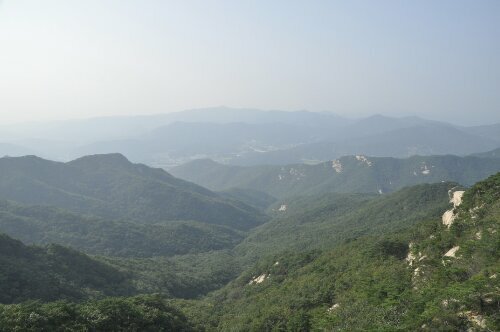 Glancing out over the forested scene below I lightened my load with a quick drink from my camelback before continuing upward. 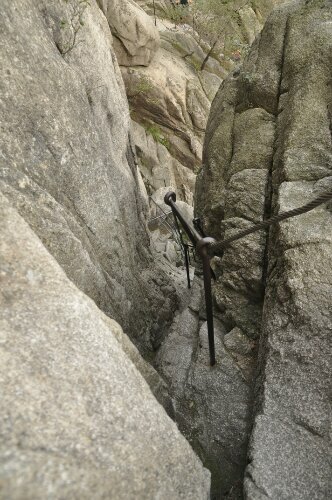 Some bouldering led to a series of much needed ropes and beams to continue the climb. 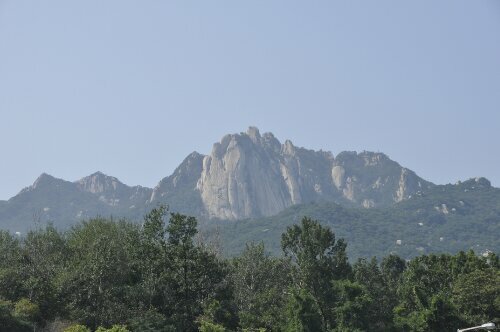 Before long I could see the peak again. 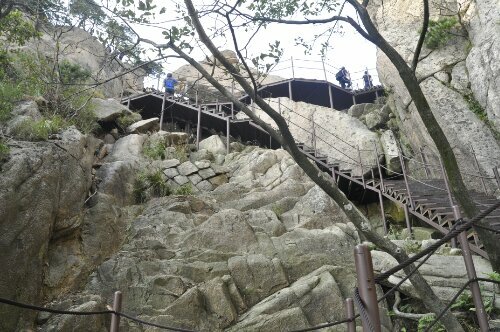 I was greeted with one more set of stairs and another series of beams to pull myself up the nearly vertical climb. This was more intense than I had antcipated; I felt surefooted and well balanced, happy for the lack of wind that there were people all around me. Bracing my feet against the poles I slowly pulled myself up by the ropes. 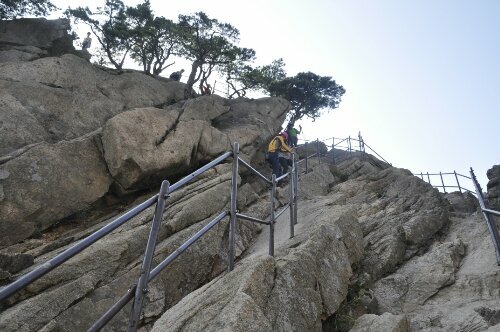 I took one step after the next when suddenly I was at the top! 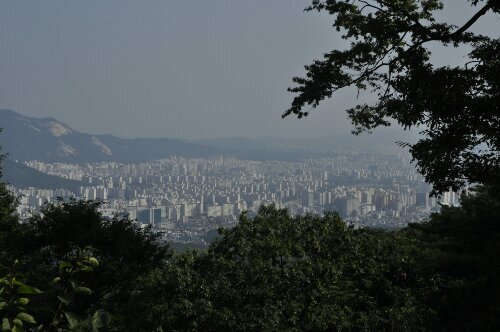 Nearly 2 hours of climbing had paid off with a 360 degree view of mountains, the megapolis and a forested valley below. The city is so humongous that you can’t even see the end of it. It just keeps going for miles and miles. Sweaty from my climb I sat down to enjoy my lunch with the wind cooling me off. After eating I exchanged picture taking with a stranger and basked in the afternoon sun. In the distance I could see some rapellers finish their picnic and get ready for their descent. Lingering a moment longer I took out my guidebook to determine how best to make my own descent. 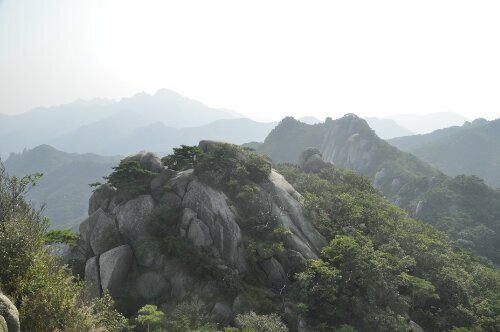 It recommended following the ridgeline to another peak and making my way down a different path. Eager to see more of the park I ignored the “not for the faint of heart” warning. How bad could it be? I took one last picture of the ridge I was about to hike and made my way back down the path this time taking the left fork deeper into the park. 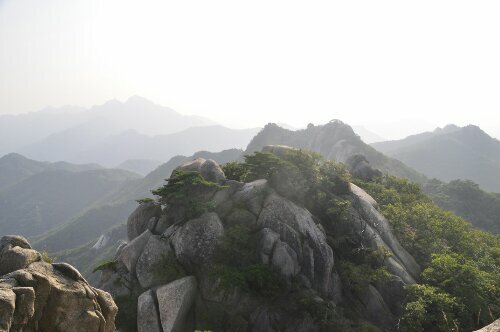 Before long I found myself at the next peak. The hike between them was mild compared to what I had seen. 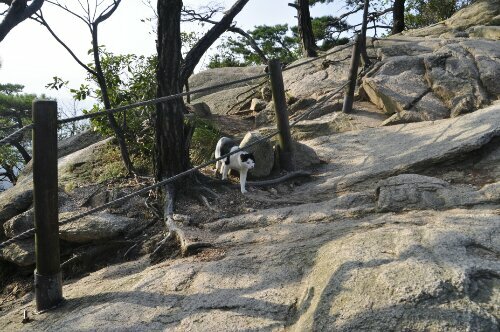 Throughout my trek I saw minimal wildlife and was quite suprised to find a cat stalking its way about. 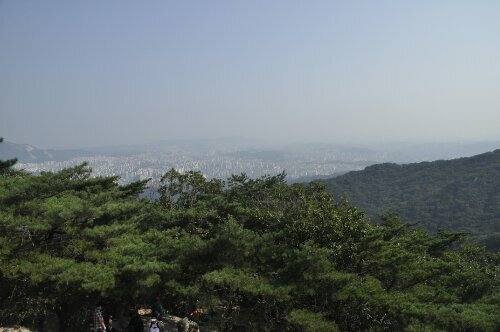 I paused only briefly at Podae Peak before continuing onward. 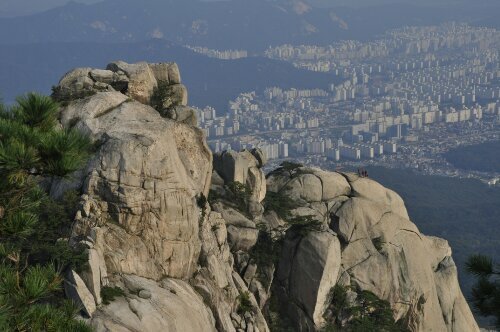 The natural beauty at this peak shrouded more of the city and although quite amazing it paled in comparison to my previous 360 degree view. Again I was drawn towards the sweet sound of music when I found a lone piper playing a beautiful ballad for the green valley. The ridgeline had few travelers and was barely wide enough for one. Crossing paths prooved to be a delicate dance I was glad I only did a couple times. A few more meters and I came across my steepest descent yet. 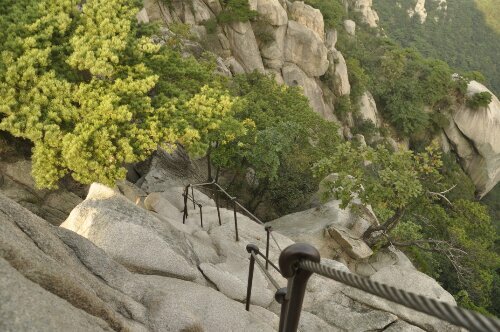 In order to get to the next ridge I had to climb down a steep series of ropes. 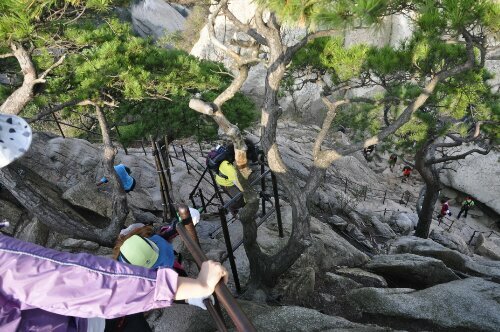 I was slowly struggling my way down when my backpack became tangled in the ropes and I heard shouting in Korean. I stopped and looked confusingly at them and then I understood “turn” and “change,” quickly realizing they were advising me to turn around and go down backwards. Climbing down as a baby learning how to tackle its first flight of stairs I made it to the bottom where I met the couple who helped me out. 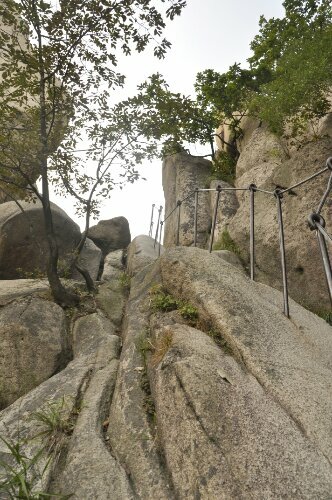 I said a quick gomabsuenida (thank you) and stood in a small alcove to let them pass before ascending an equally difficult series of poles and ropes. 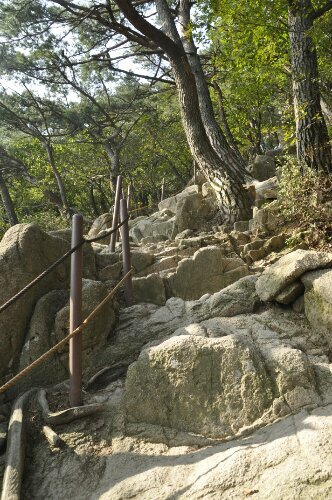 The climb up was worse than the way down. It was just as steep but even slicker with fewer foot holds. Bracing one foot against the pole and pulling hard with my hands I was able to gain some leverage and slowly make my ascent. I can’t imagine what it would have been like before the ropes and poles were here. Finally at the top I ran into my first white people! 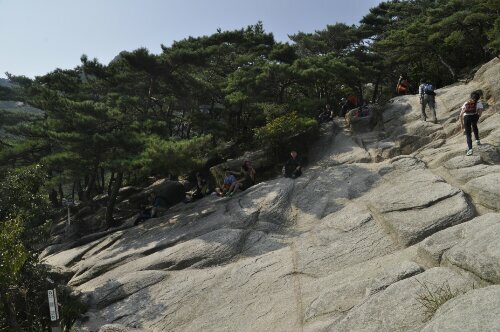 A group of European students had been hiking all day and was enjoying a break. I decided that I deserved a rest after that climb too. Felix, Ines and Adam were from Switzerland, Croatia and Poland respectively. Enjoying the conversation we decided to head down the mountain together. I’m not sure if they were lured by my English or the fact that I had an English trailmap, but I wasn’t complaining about my new friends. Thanks for reading! I do my best to do some quick research about where I’ve been or what I’ve done and add it to my own experiences. Maybe its just the teacher in me. Keep following for more posts! presentation subject, which i am going to deliver in school. Burke, thanks for your comments! Always glad to help and I hope you got an A on your presentation! 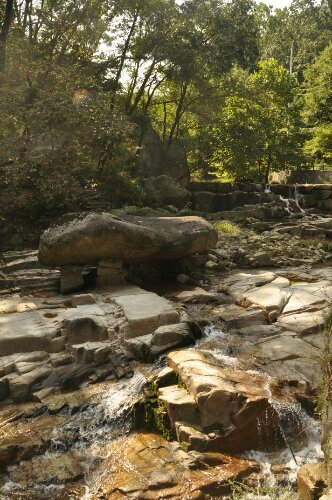 My facts are from a mixture of my guidebook, my Bukhansan National Park Map and wikipedia. Thanks for the positive feedback! Thumbs up> Thumbs down. Good day to you too. be a great author.I will be sure to bookmark your blog and may come back very soon. Elias, thank you for stopping by! I’m glad you enjoy my writing. Its comments like yours that keep me jotting down my adventures. Thanks for your support! Glad I could help. Thanks B! Glad you’re enjoying it. Hi, I do believe this is a great web site. I stumbledupon it 😉 I’m going to revisit yet again since I saved as a favorite it.